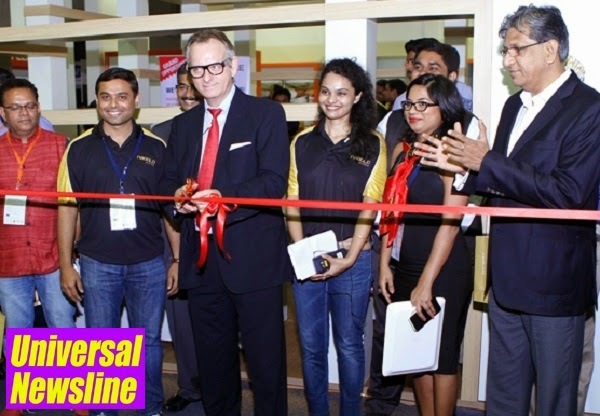 Mumbai, 9th October 2014: Hafele today unveiled the NAGOLD series, an exclusive range of home appliances for the Indian kitchen. The attractively priced NAGOLD series will cater to all cooking, refrigeration and cleaning needs amidst an experience of supreme efficiency. Named after the place of its origin of 90-year-old Häfele Empire, the NAGOLD Series, Hafele reiterates its promise to offer the best in kitchen efficiency, convenience and excellence in quality and functionality. · Built in Hobs: Durability> Efficiency> Safety best describe Häfele Nagold’s range of built-in Gas Hobs that are designed for Indian cooking requirement with High power triple flame wok burners, enhanced safety features with Flame Failure Safety device and meet all your cooking requirements. The complete combustion of the flames avoids the emission of harmful substances or by-product which otherwise will be harmful to the environment and health of the person cooking. These ranges of products comes with a unmatched functionality and are priced between 16,000 and 37,000. · Built-in microwave and electric ovens: Nagold’s range of built-in electric and Combi-microwave ovens offer you a host of contemporary cooking options; precise temperature settings enhances the art of baking and roasting evenly. These machines comes with additional cooling fans to avoid excess heat remitted during usage as well as its multiple cooking functions make your cooking experience recreational and fun! Available from 23,000 to 63,000. · High Performance cooker hoods: Häfele Nagold’s highly efficient and stylish range of cooker hoods free your kitchen from unwanted and unhealthy cooking smoke and residues; all that’s left to sniff is the welcoming fragrance of appetizing delicacies in the price range of Wall Mounted hoods is 16,000 – 36,000 and Island hoods range from 33,000 - 79,000. · Built-in Barbeque & Deep Fryer: Now extend your culinary experiments to occasional barbequing and frying for those special occasions available at the price range of 47,590 to 53,290. · Built in Dishwashers: Extremely hygienic and energy efficient, these dishwashers sweep your dishes clean off any food residue or bacteria there by reducing the risk of illness. With an advanced mechanism and improved technology, Nagold’s dishwashers are trained to remove even the most rigid masala stains often left behind by aggressive Indian cooking. Available in the price range of 52,000 and 59,000. NAGOLD promises to make cooking a recreational activity, not just a chore! To learn more visit us at www.nagoldappliances.com. Häfele set foot in India in 2001 as a liaison office essentially handling Hospitality projects for its line of Access Control Systems – Dialock. The growing hardware demand and the increasing architectural maturity motivated the company to start full commercial operations in India in 2003 as a wholly owned subsidiary by the name, Häfele India Pvt. Ltd. With its head office in Mumbai, 6 regional offices with Design Centers in all major metros and sales presence across the country, Häfele India has, over the last 10 years, acquired a leading position in the Indian Architectural Hardware Industry. Today, Häfele India employs over 450 people who cater to a wide customer base with the help of an efficient distribution network, comprehensive logistics system and a sophisticated warehouse located in Mumbai. Häfele India lays pride in its diverse range of quality products, well-networked channel partners and unmatched service to customers; with an overall product range consisting of more than 150000 articles and 400 dealers across India. The ability of the company to understand the diverse Indian market and adapt to the changing tastes and trends, has made it an authority in the field of architectural hardware, furniture fittings and kitchen fittings and accessories. With this successful backing and the promise to grow in manifolds, the company has expanded to meet the ever-growing demands not only from India but also its neighboring countries. Owing to this, Häfele India has spread its operations to countries like Nepal, Bangladesh, Bhutan and most recently, Sri Lanka. The company has also forayed into related industries by launching independent product verticals namely Kitchens, Appliances, Lights, Sanitary and Quartz Surfaces to cater to the focused demands from these industries.